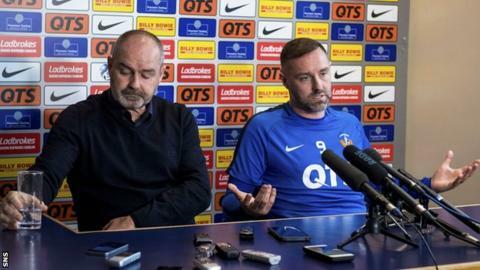 Deducting points from Scottish clubs for the misconduct of their fans would be a "load of rubbish", says Kilmarnock striker Kris Boyd. Under 'strict liability', which operates in Uefa competitions, clubs are sanctioned for the misbehaviour of their supporters. Boyd was hit by an object and said he was subject to abuse as he warmed up during his side's defeat by Celtic. "We're talking about deducting points - what a load of rubbish," he said. "It's not possible to do it. Say Celtic are top of the league, some idiot can go and pay a Rangers fan to sit in the Celtic end, throw a bottle and get points taken off them. "It's ludicrous to suggest we'll take points off somebody." Kilmarnock boss Steve Clarke described sectarianism in Scotland as a "sad reflection on us as a society" after saying he faced abuse from the "dark ages" in the Rugby Park side's loss to Rangers at Ibrox. Boyd believes sectarianism is a "wider" problem beyond the sport. "It's not just football clubs, it's society that needs educated right from the very bottom," the striker added. "You're not born a bigot, you're not born a racist - it's taught. People teaching their kids to do it, maybe go the other way. "Maybe because it happens that often, it is water off a duck's back [to me]. Does it make it right? No. It's gone that step too far and when you get coins thrown or objects thrown at people, there's a problem that needs addressed."